A map of hydrogen on the asteroids Vesta and Ceres. The hydrogen indicates the presence of water ice. There's water, water everywhere on the dwarf planet Ceres, according to new research. New observations have provided direct evidence that water ice is ubiquitous on the surface and shallow subsurface of this massive asteroid. Ceres is the largest object in the asteroid belt that lies between Mars and Jupiter, and has long been suspected of containing significant amounts of water — estimates projected up to 30 percent of its total mass. Evidence has pointed to water ice being mixed with the rock on Ceres' surface, and in a few rare cases, more concentrated patches of exposed ice have been found. Ceres has even belched up plumes of water vapor. The global map was created using an instrument on NASA's Dawn probe, which is currently orbiting the dwarf planet, called the Gamma Ray and Neutron Detector (GRaND). This instrument detects two kinds of particles: neutrons, one of the particles that make up atoms, and gamma rays, very high-energy light. When cosmic rays (very high-energy particles from space) crash into the surface of the dwarf planet, the collision can create a spray of debris particles, including neutrons and gamma rays. But the debris isn't random; the characteristics of some of those gamma rays and neutrons can provide information about the chemical composition of the surface of Ceres and to certain depths below the surface. So scientists looking at data from GRaND can learn about the abundance of elements, including potassium, iron and hydrogen on the surface of Ceres, and to a depth of about 3 feet (1 meter). The instrument cannot directly detect water molecules, but that can be inferred from the data, according to the authors. One way this is done is with computer models, which can recreate the evolution of Ceres, producing various possible outcomes that show how those elements (and water) would be distributed today. Comparing the models with the new map shows that water ice on Ceres is concentrated near the poles: At high latitudes (past about 40 degrees in both hemispheres), water ice on the surface of Ceres and in the layers just under the surface may compose up to 27 percent of Ceres' mass, according to the new research. Near the equator, the water ice concentration is much lower. They researchers also compared the map of Ceres with a map of Vesta, another body in the asteroid belt. 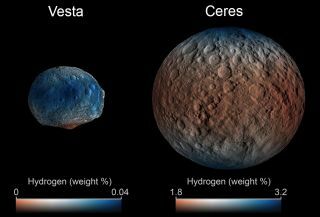 The data from those global maps show that Ceres has over 100 times more hydrogen than Vesta, and that the hydrogen is distributed more evenly over the surface. That indicates some kind of global process, which implies that water was (and still is) a large component of Ceres' composition, according to the lead author of the new research, Thomas Prettyman, principal investigator for GRaND. Prettyman spoke at a news conference today (Dec. 15) at the annual meeting of the American Geophysical Union in San Francisco. Prettyman also noted that Ceres' composition has been compared with a family of meteorites called carbonaceous chondrites. These rocks, like most asteroids in the asteroid belt, have evolved very little since the early days of the solar system. But the new map (which also shows the distribution of iron and potassium on Ceres) shows some key differences between Ceres and these meteorites. "If you look at the elemental composition of Ceres, it bears some resemblance to the carbonaceous contrite meteorites," Prettyman said. "But there are differences that support the idea that ice and rock that came together and formed Ceres actually separated in the interior and were redistributed by processes like convection." It is possible that Ceres harbors a liquid ocean deep below its surface, but if that is the case, the ocean is likely composed of a very salty chemical mixture, with little or no water, according to Carol Raymond, deputy principal investigator of the Dawn mission, who also spoke at the news conference. Instead, the new results indicate Ceres' water is largely stored in ice deposits near the surface. A separate study appearing in the journal Nature and also released today revealed the presence of a concentrated patch of surface ice on Ceres, located in a regions cloaked in permanent shadow. But this and other patches of surface ice deposits are "rare," according to the paper's authors, and don't add up to anywhere near the total amount of ice now thought to lie buried just under Ceres' surface. The Dawn probe entered into orbit around Ceres in March 2015. The spacecraft completed its primary mission in June, and continues to study Ceres as part of its extended mission.